Outlines the correct procedures for doing FMEAs and how to successfully apply them in design, development, manufacturing, and service applications There are a myriad of quality and reliability tools available to corporations worldwide, but the one that shows up consistently in company after company is Failure Mode and Effects Analysis (FMEA). 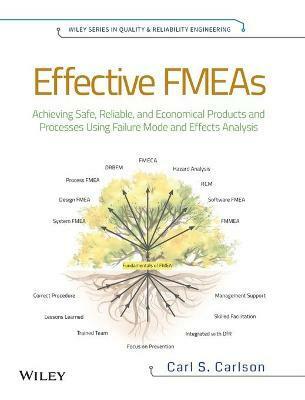 Effective FMEAs takes the best practices from hundreds of companies and thousands of FMEA applications and presents streamlined procedures for veteran FMEA practitioners, novices, and everyone in between. Written from an applications viewpoint with many examples, detailed case studies, study problems, and tips included the book covers the most common types of FMEAs, including System FMEAs, Design FMEAs, Process FMEAs, Maintenance FMEAs, Software FMEAs, and others. It also presents chapters on Fault Tree Analysis, Design Review Based on Failure Mode (DRBFM), Reliability-Centered Maintenance (RCM), Hazard Analysis, and FMECA (which adds criticality analysis to FMEA). With extensive study problems and a companion Solutions Manual, this book is an ideal resource for academic curricula, as well as for applications in industry. In addition, Effective FMEAs covers: * The basics of FMEAs and risk assessment * How to apply key factors for effective FMEAs and prevent the most common errors * What is needed to provide excellent FMEA facilitation * Implementing a "best practice" FMEA process Everyone wants to support the accomplishment of safe and trouble-free products and processes while generating happy and loyal customers. This book will show readers how to use FMEA to anticipate and prevent problems, reduce costs, shorten product development times, and achieve safe and highly reliable products and processes. Written from an applications viewpoint--with many examples, detailed case studies, study problems, and tips included--the book covers the most common types of FMEAs, including System FMEAs, Design FMEAs, Process FMEAs, Maintenance FMEAs, Software FMEAs, and others. It also presents chapters on Fault Tree Analysis, Design Review Based on Failure Mode (DRBFM), Reliability-Centered Maintenance (RCM), Hazard Analysis, and FMECA (which adds criticality analysis to FMEA).